Turkish draughts board and starting setup. White moves first. Turkish draughts (also known as Dama) is a variant of draughts (checkers) played in Turkey, Egypt, Kuwait, Lebanon, Syria, Jordan and several other locations in the Middle East. The first official Turkish draughts World Championships were held in Izmir 22-24 October 2014. On an 8x8 checkered board, 16 men are lined up on each side, in two rows. The back row is vacant. A traditional gameboard is mono-coloured. Men move orthogonally forwards or sideways one square, capturing by means of a jump; they cannot move or capture backwards or diagonally. When a man reaches the back row, it promotes to a king. Kings can move any number of empty squares orthogonally forwards, backwards or sideways. 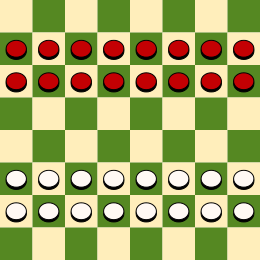 A king captures by jumping over a single piece any number of empty squares away, landing on any open square beyond the captured piece along a straight line. Pieces are removed from the board immediately after being jumped. If a jump is available it must be taken. If there is more than one way to jump, the one capturing the most number of pieces must be taken. There is no distinction between king and man during captures; each counts as a piece. If there is more than one way to capture the maximum number of pieces, the player may choose. Within a multicapture, turning 180 degrees between two captures is not allowed. A man that promotes to king by jumping continues to jump (if possible) as part of the same move. A player wins if the opponent has no legal move, either because all his pieces are captured or he is completely blocked. A king versus single man also wins the game. Without the rule whereby a player wins in the case of king versus a single man, the player owning the man could avoid capture indefinitely.